Implement Proven Database Optimization SolutionsSystematically identify and eliminate database performance problems with help from Oracle Certified Master Richard Niemiec. 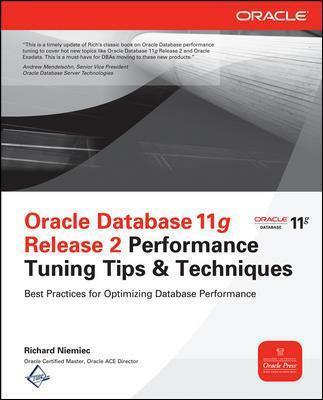 Filled with real-world case studies and best practices, Oracle Database 11g Release 2 Performance Tuning Tips & Techniques details the latest monitoring, troubleshooting, and optimization methods. Find out how to find and fix bottlenecks, configure storage devices, execute effective queries, and develop bug-free SQL and PL/SQL code. Testing, reporting, and security enhancements are also covered in this Oracle Press guide.